Today brings news of another significant cut in the price of the 40m motor yacht AquaLibrium, a co-central agency for sale by Mark Elliott and Noell Vawter at International Yacht Collection. AquaLibrium was built in Ancona, Italy in 1995 by the well respected CRN shipyard and refitted in 2009. This superyacht has been tastefully decorated and offers an impressively large volume interior as well as spacious outside deck space for activity, entertaining or merely relaxing. AquaLibrium also features an extensive range of water toys and accommodates up to 10 guests in a master, VIP, double and two twins plus two Pullman berths. 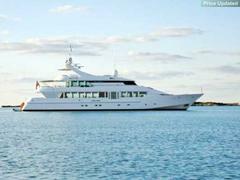 Previously asking $11.9 million, AquaLibrium is now priced at $9.9 million.